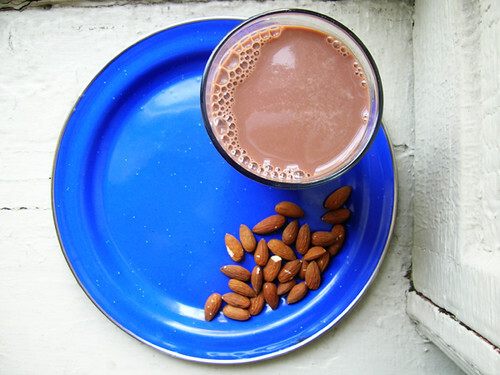 Kind of a perfect combo for a post-workout snack that couldn't be easier, almonds and a glass of chocolate silk. Or chocolate milk, if you drink milk. Not gonna lie, I drink an immoderate amount of chocolate silk: that's a pint glass. I know I said that I don't count calories, except that sometimes I do as a sanity check. So a pint of chocolate silk is 280 calories plus, what, 200 calories for the almonds, speaking of calorie dense. So we're talking close to 500 calories for a snack, that's a pretty good-sized snack. Which is to say, a meal. Not real worried—say I'm shooting for 2000 daily calories, I eat four meals per day so 2000 total calories divided by 4 meals is 500 calories per meal; that's my basic rule of thumb, I did actually scale back from laying on the couch with the jar of almonds open on my stomach to get under the five hundred. I said earlier that I get half of my dinner before my workout and half after, now you can see that caloriewise I actually get a whole meal before and a whole meal after. They just look like half portions because they're the calorie-densest meals I eat. So this is a little about knowing your food and adjusting for what it is with regard to how much room it takes up on your plate.